The National Recording Registry of the US Library of Congress has announced its 2013 additions. 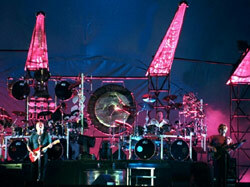 Among the 25 recordings earning the honor this year is Pink Floyd's Dark Side Of The Moon. Also getting recognition as culturally or historically significant in the ears of the institution are soundtrack to Saturday Night Fever, The Twist by Chubby Checker and Sounds Of Silence, the haunting song Simon & Garfunkel wrote and recorded after President John F. Kennedy was gunned down in Dallas. Dark Side had the strongest showing among public nominations. The LOC called it a, '...brilliant, innovative production in the service of the music.' Amen to that.